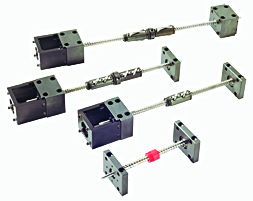 Lintech offers ball screw assemblies. Of course, there are other companies who offer them as well. However, Lintech makes the design and ordering process easier than almost everyone else. A project which is to incorporate a ball screw assembly will often require complementary components to finish the integration. Lintech has the integration components included in the part numbering scheme. For example; a ball nut needs to be connected to the driven load. The screw needs to be connected to a motor via a coupling. Will the system require independent ball screw support blocks? There are many other considerations as well. If you can design and obtain these complementary components as you are selecting the ball screw, you can save a lot of time and know that these complementary components are appropriate matches for the screw assembly. If you are working on a project which will require a ball screw assembly, consider Lintech. Check out Lintech’s ball screw assemblies.